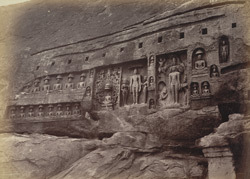 Photograph of the Jain figures carved in the rock face at Kalugumalai, from the Album of Miscellaneous views in India, 1860s. Behind the rock from which the Vattuvan Kovli temple was hewn, is a steep cliff carved with a row of Jain figures belonging to the 8th and 9th century . There is a large life-size Trithankara with a crowned figure, possibly a king, kneeling in front. Another Trithankara sits on a lion-throne surrounded by attendants.